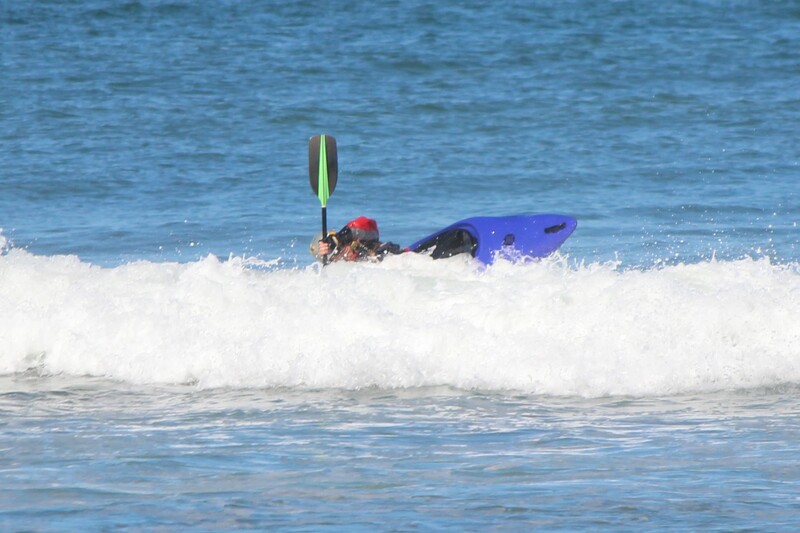 I slip the spraydeck over the kayak coaming as a small wave washes under the kayak. 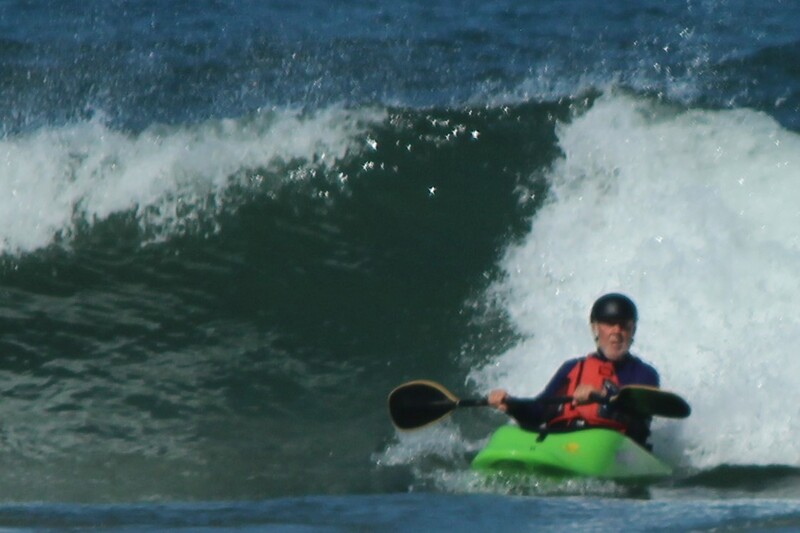 Grabbing my paddle I feel the surge lift the hull and I’m free of the land. 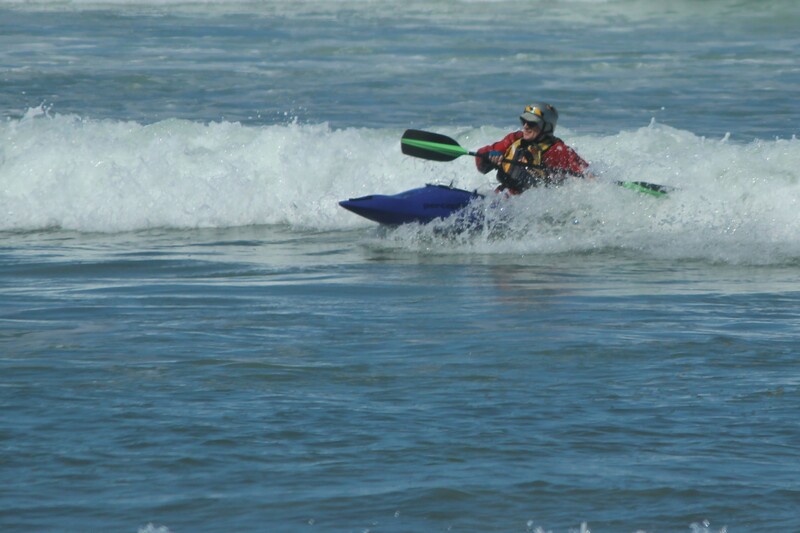 I take a few strokes into the blackness and feel the bow rise again this time a flood of water pours over the kayak followed soon after by another wave that sends water pouring over my head. 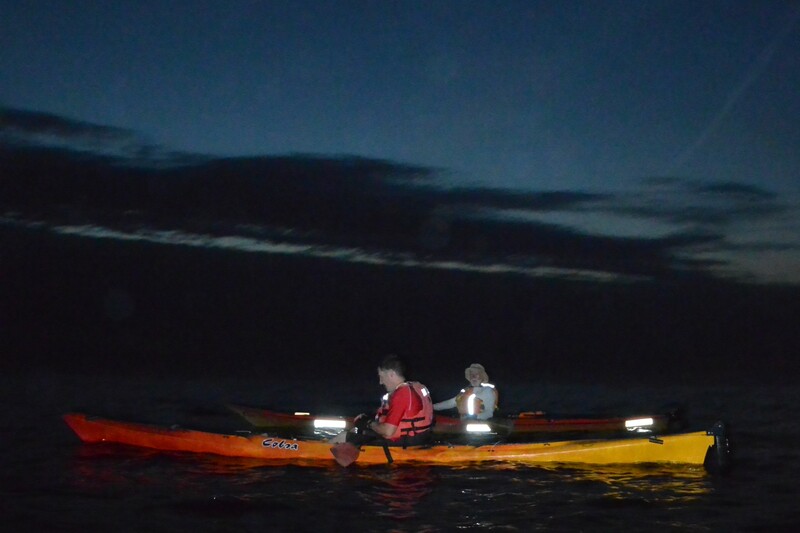 Well that’s a nice introduction to night paddling. 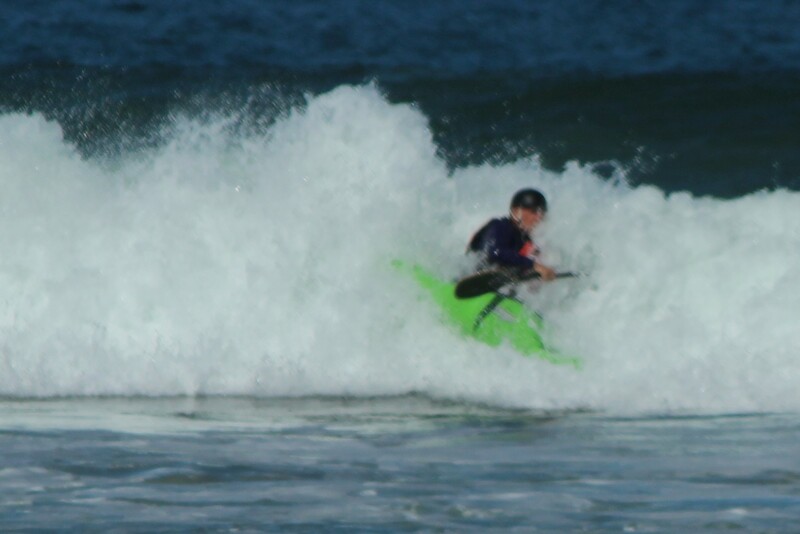 Luckily it’s not mid winter when the cold water drenching would have really questioned my sanity. When the sun goes down the familiar seascape fades and takes you to the twilight zone, where the familiar horizon disappears and a small distance ahead becomes your whole world. 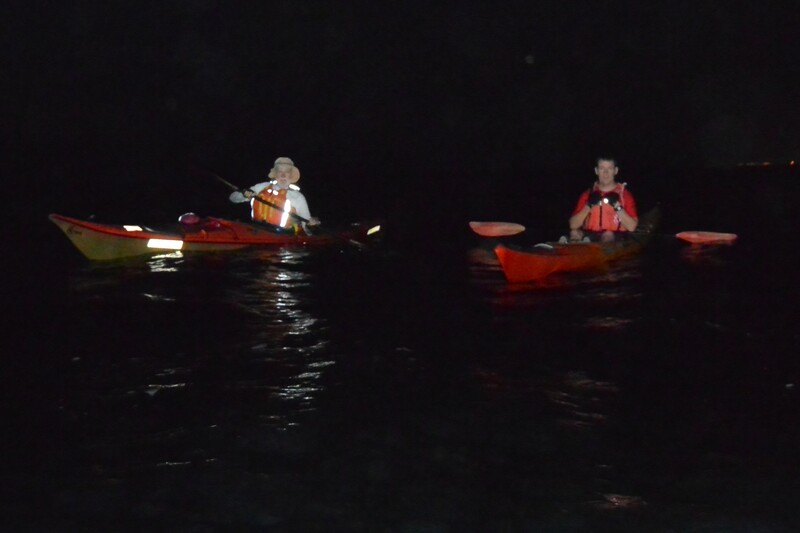 Distances seem difficult to calculate, even when paddling along a coastline lit up by the city lights. 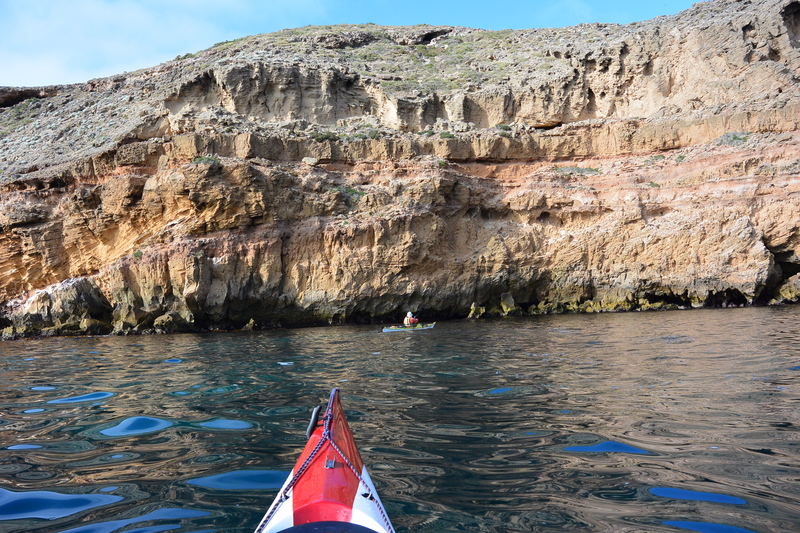 Familiar cliffs and beaches along the regular route seem to be somehow different and the small line of white water crashing onto the beach seems louder than ever. 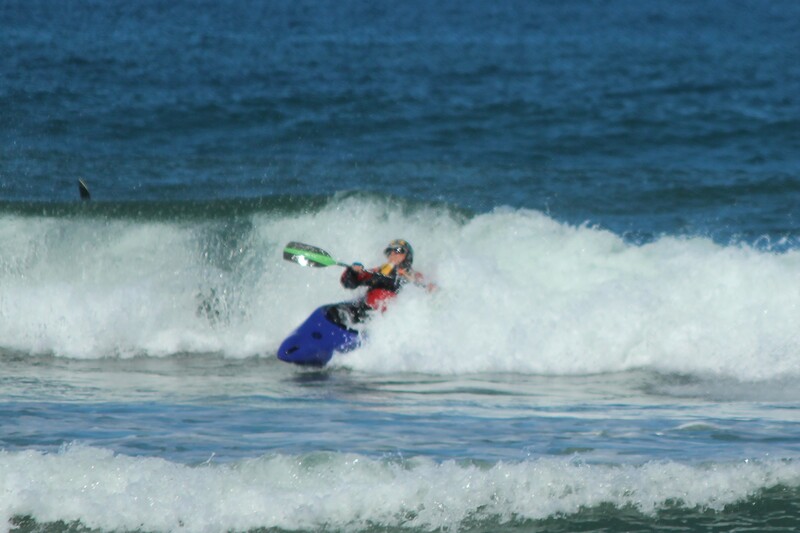 Sometimes you are lucky and the wind drops to give you amazing glassy conditions. 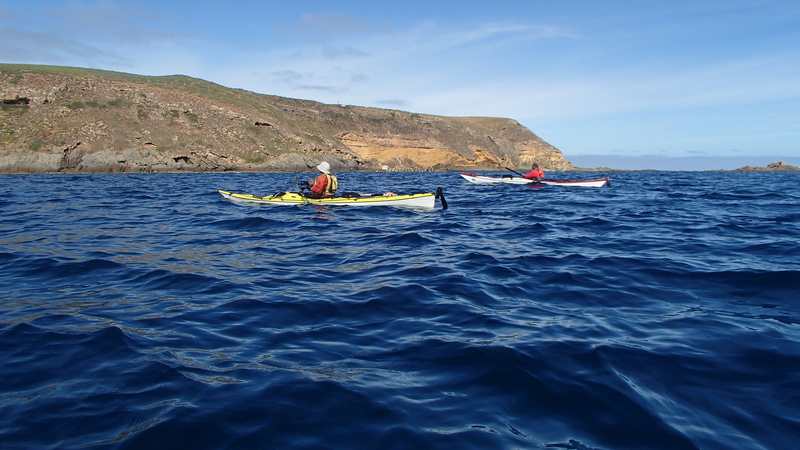 You can glide along while taking in the beauty of coastal silhouettes. Photography takes on a new dimension. 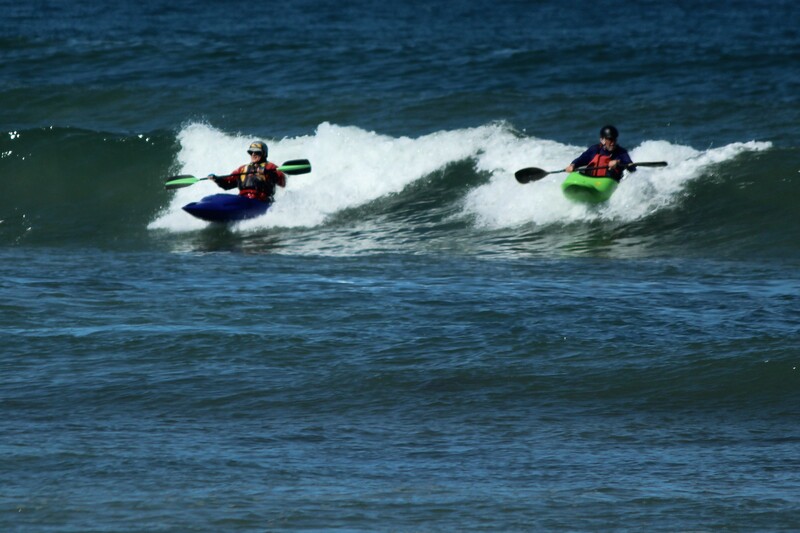 Paddling with others can be both challenging and fun. 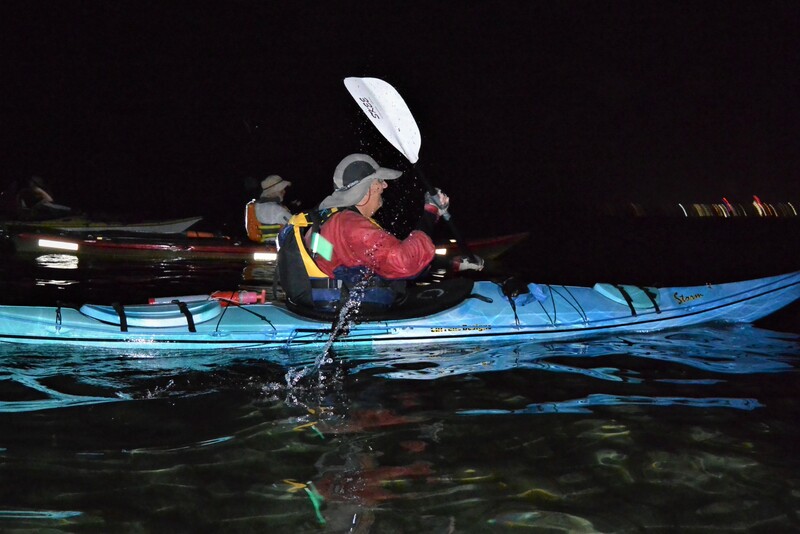 Experienced night paddlers seem able to anticipate each others actions and reactions allowing a certain amount of freedom without compromising safety. 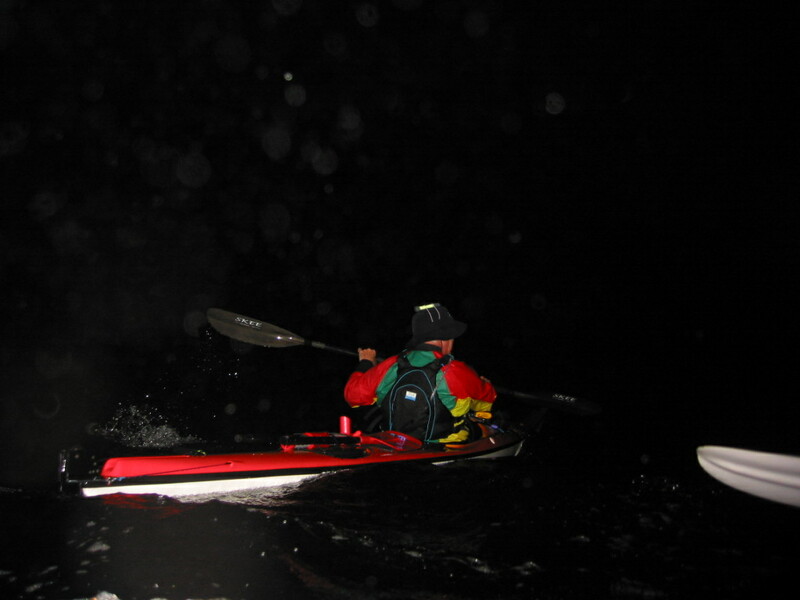 Getting happy snaps of your fellow paddlers in the dark becomes challenging but often rewarding. Sometimes it’s a wrestle with the camera to get a focus point and then you get a lot of flare from the reflective material on kayaking gear. I have gone from a Canon point and shoot style camera to a Nikon DSLR and sometimes the increased complexity pays dividends and sometimes it doesn’t. 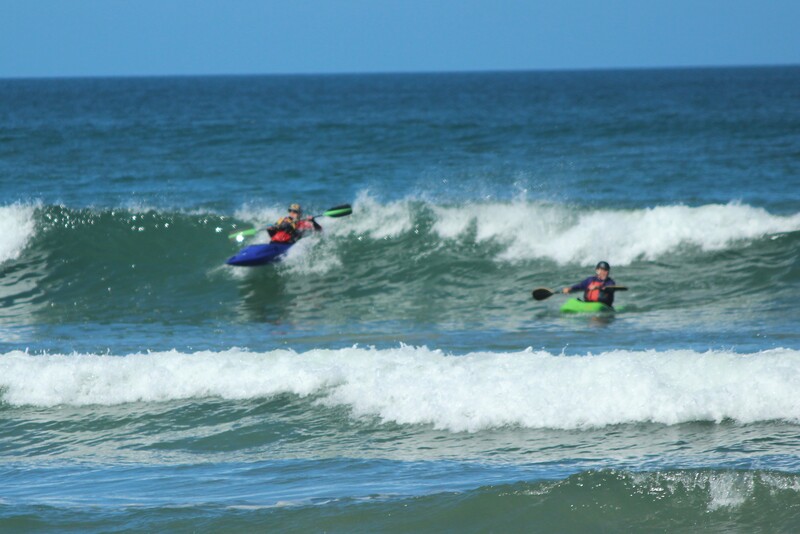 Practice with the Nikon will eventually pay off ! 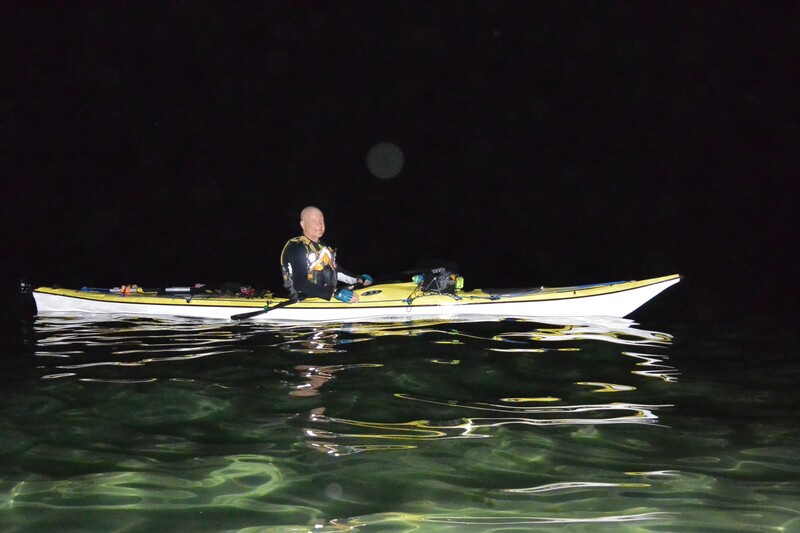 A calm night with no moon made for an great paddle with Mike, Michael, Steve and Mark along our local coast and I even got a few reasonable shots. 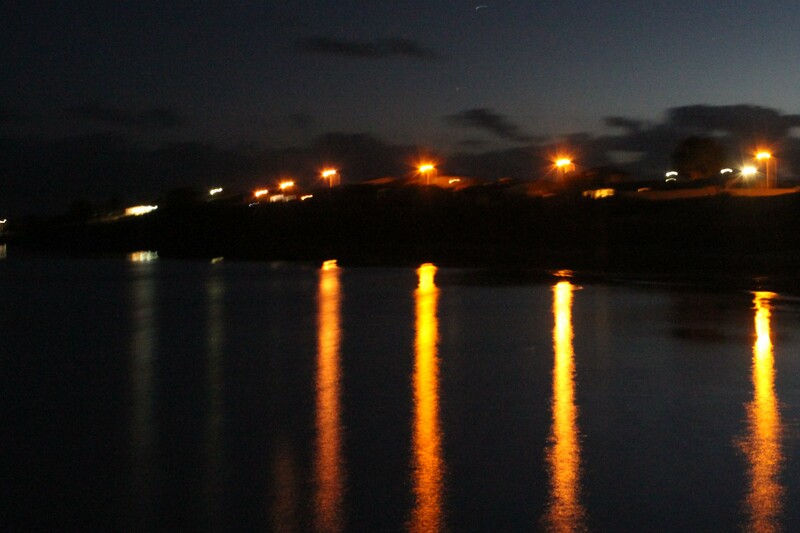 The stars were visible as the clouds cleared making for a lovely night on the water. Mike and Mark enjoying the night sky. 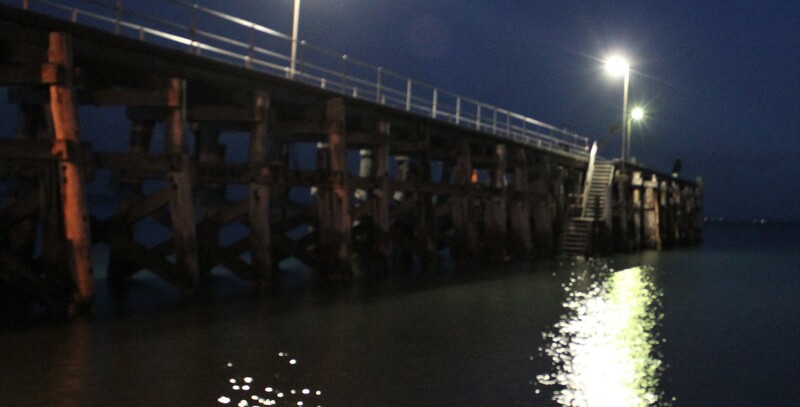 The man made structures take on a different look as you glide past, with their lights reflected in the water. The coastline of the city seems deserted when you can’t make out any human movement along the normally busy boardwalks. 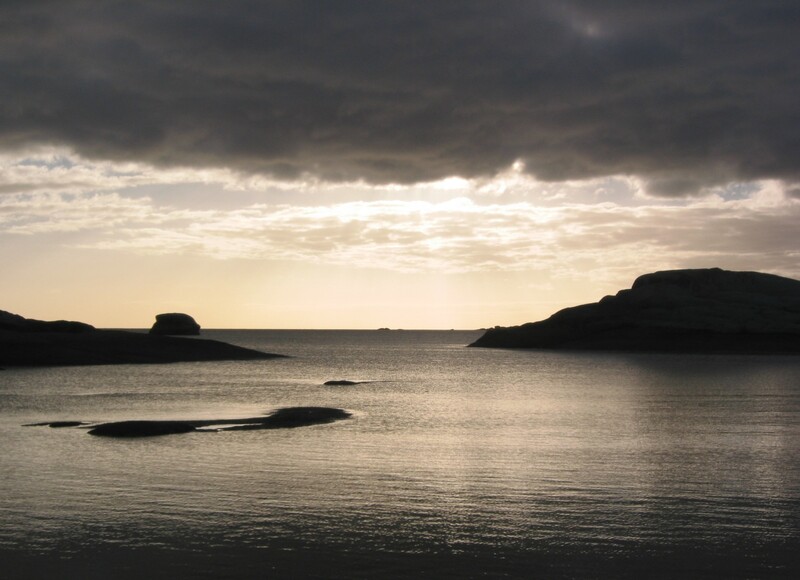 As you meander further offshore the city becomes a ribbon of light on the horizon. 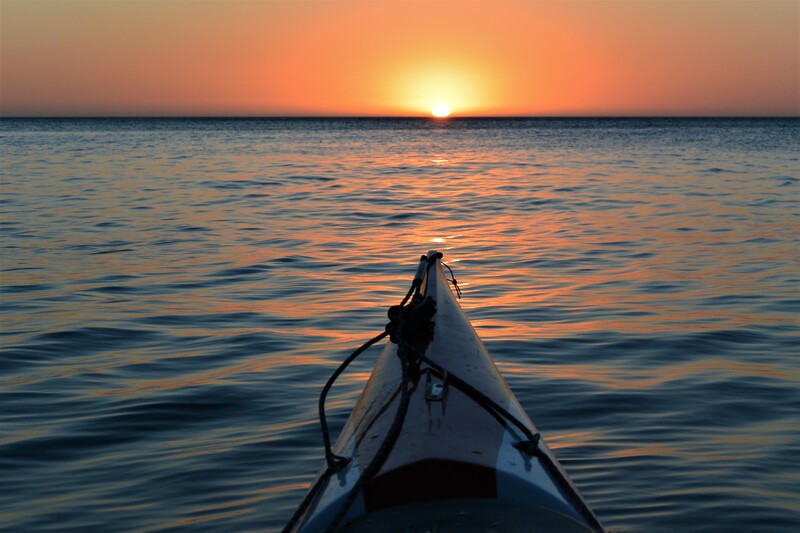 Very occasionally my paddle will “double dip”, showing both sunset and moon rise, which is amazing. Often I begin just before sunset allowing me time to organise my gear without torch light and this presents other photo opportunities. Over the years there have been memorable “night landings”. 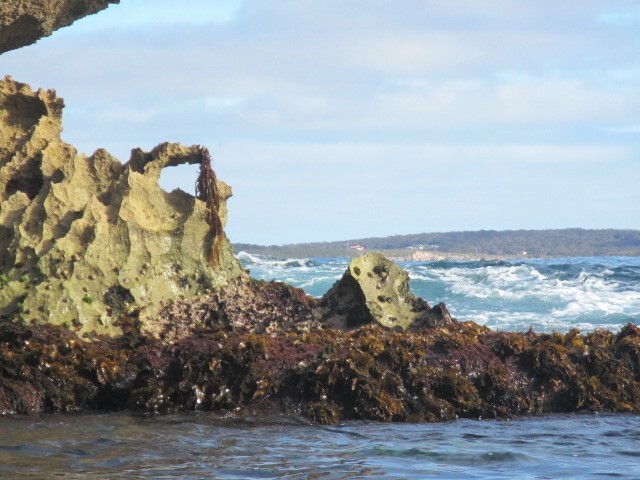 Miscalculating the landing spot and capsizing in a stinking bed of rotting seaweed (much to others amusement) ranks high among the experiences on offer as does landing on a “deserted beach” that was soon deserted by a couple of lovers. The other challenge is finding all your gear in the darkness. Hmmm….where did I put those car keys ? I had them in my hand a few minutes ago. Hey everyone; anyone seen my car keys ? 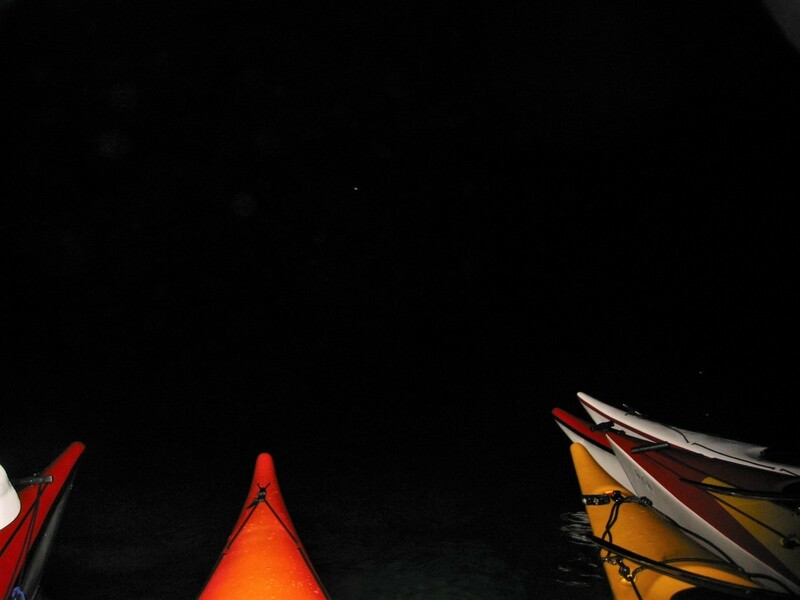 It’s fun to be a little out of your comfort zone and night paddling can easily do that. On our wanderings across the western coastline of South Australia we have come across lots of harvesting at this time of year. Not only are there long road trains carting grain to the silos but also lots of hay being stacked into large haystacks. 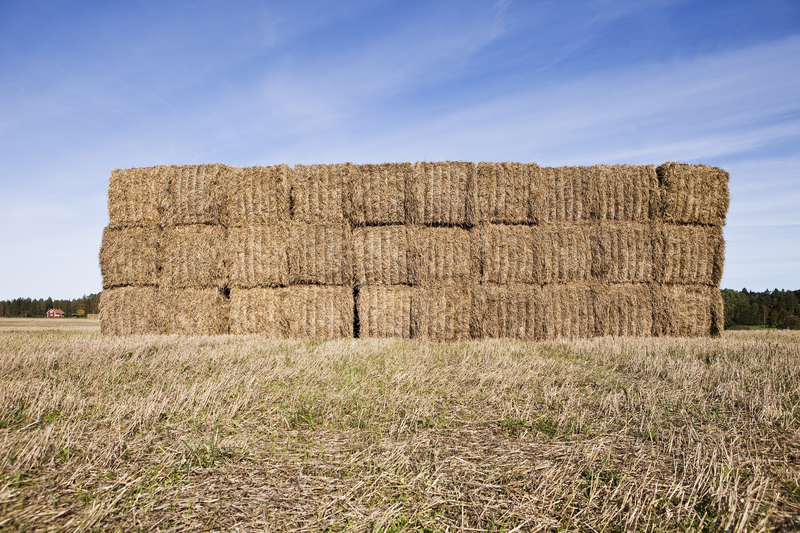 These days it’s more likely to see hay in large “rounds” stacked together rather than the traditional haystacks but we have found a couple of unusual varieties as well. 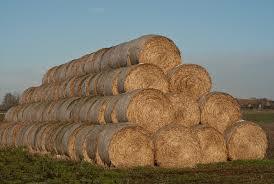 It doesn’t have to be a stack of hay bales to be called a Haystack. 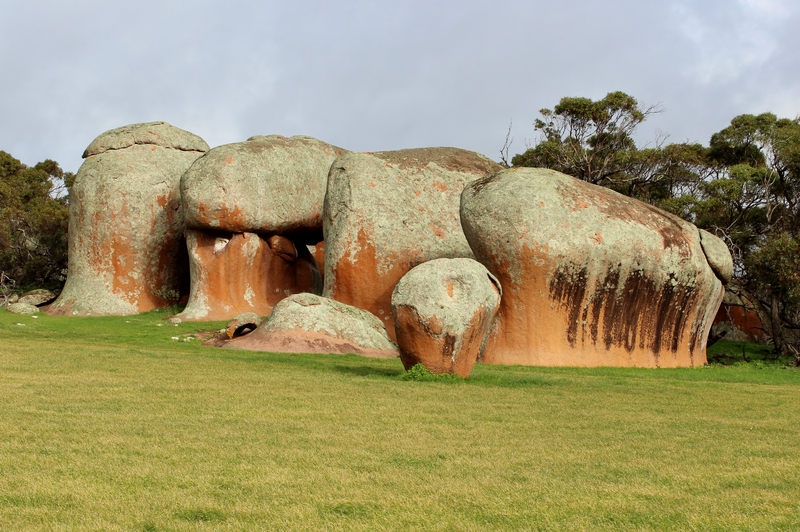 On the Eyre Peninsula we found “Murphy’s Haystacks which may look like an old fashioned Haystack but are rock formations. 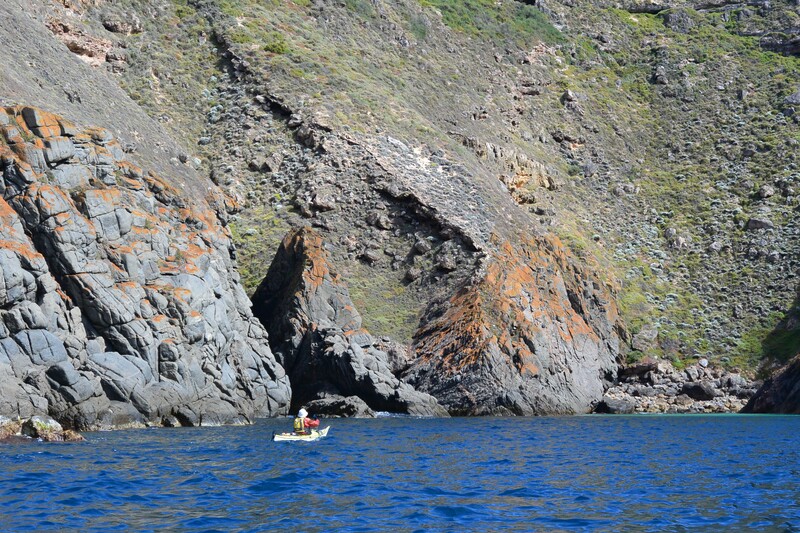 The kayak paddler comes across many and varied landscapes including islands. This one is called Haystack Island. 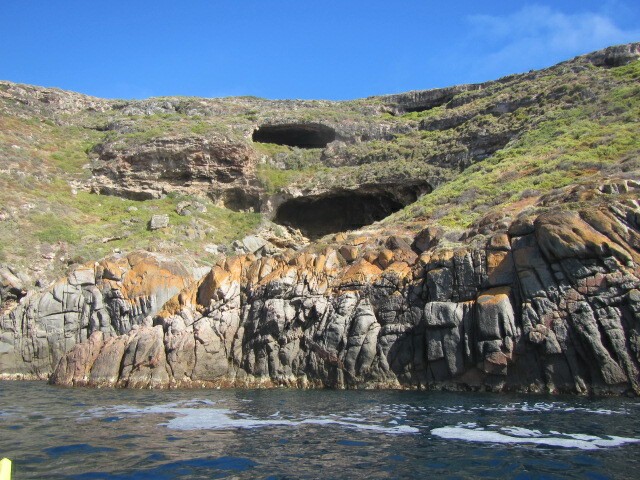 Haystack Island off the coast of Yorke Peninsula. 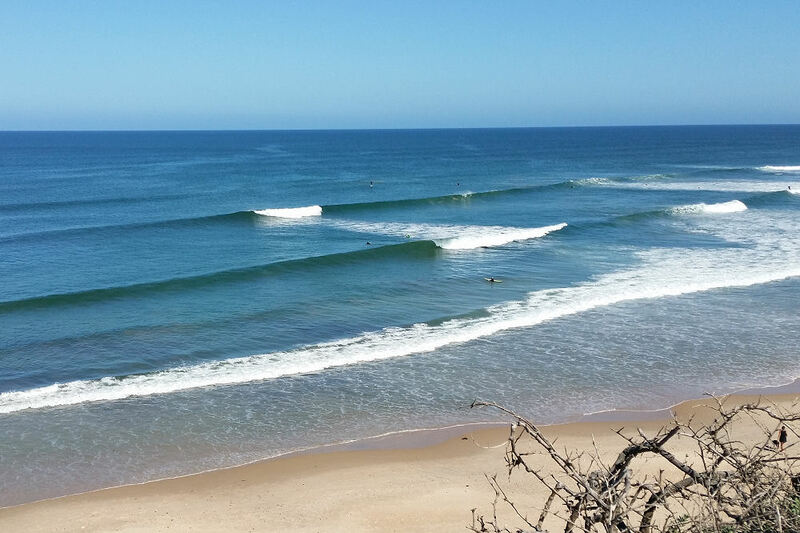 On a day with glassy swells. It might not look like a Haystack from a distance but when your up close it does take on the colours and shape of hay. It seems Australians have an imagination for names but for me the best Haystack is my visits to Haystack Island. The calm was shattered by a thunderous roar as a swell broke against the headland sending a spray of white water into the air. The calm water paddling we had enjoyed for the last couple of hours was over and we were in for some fun paddling along the “Mystery Coast”. 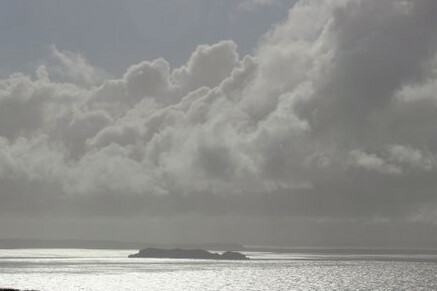 We call this area the “Mystery Coast” as the weather is always a bit of a mystery. 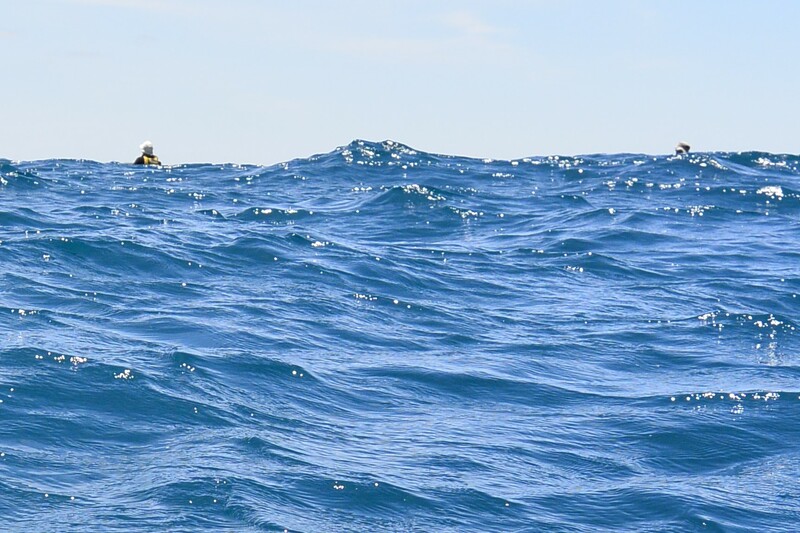 It’s forecast SE winds and you get NE; 10 knots can be 5 or 20 knots and the swell has to be taken into consideration which is not the best situation for kayakers venturing several kilometres offshore. 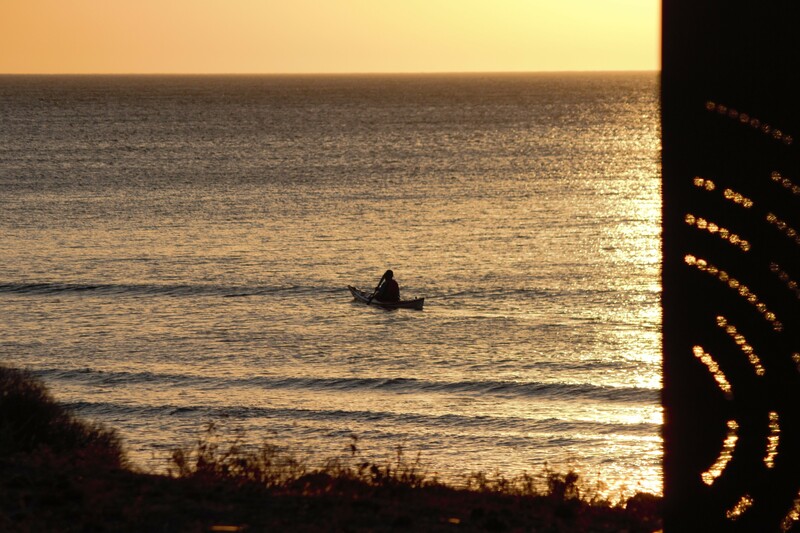 The day had started early with preparations before dawn as the predicted weather window of calm winds in the morning and an early afternoon sea breeze, had arrived. 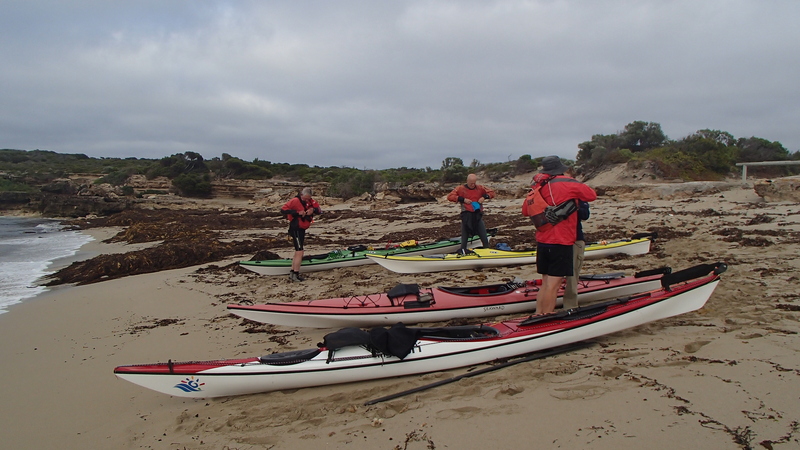 We had seen the end of Blow-vember and the promise of more stable conditions had the group heading westward from Adelaide, the capital city of South Australia, with the hope of visiting some of the rugged and seldom paddled Mystery Coast. 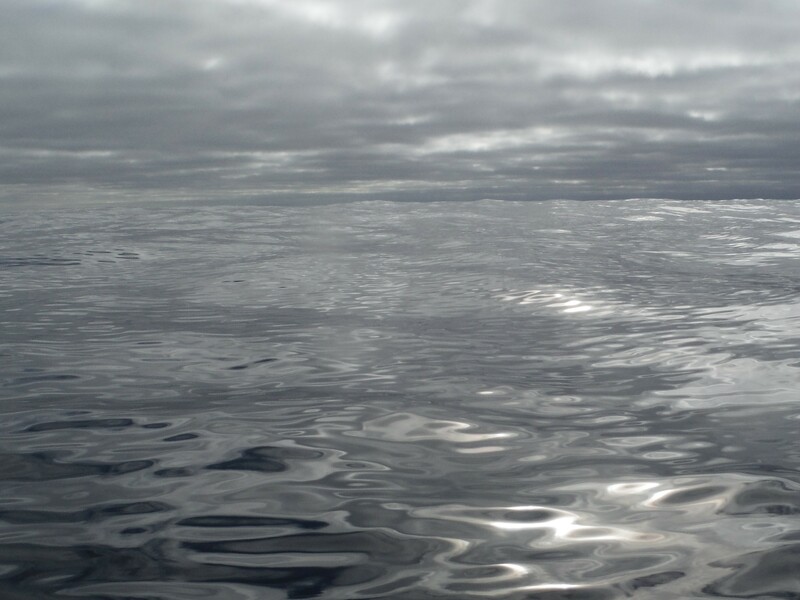 The sea was calm and the sky overcast as we launched. 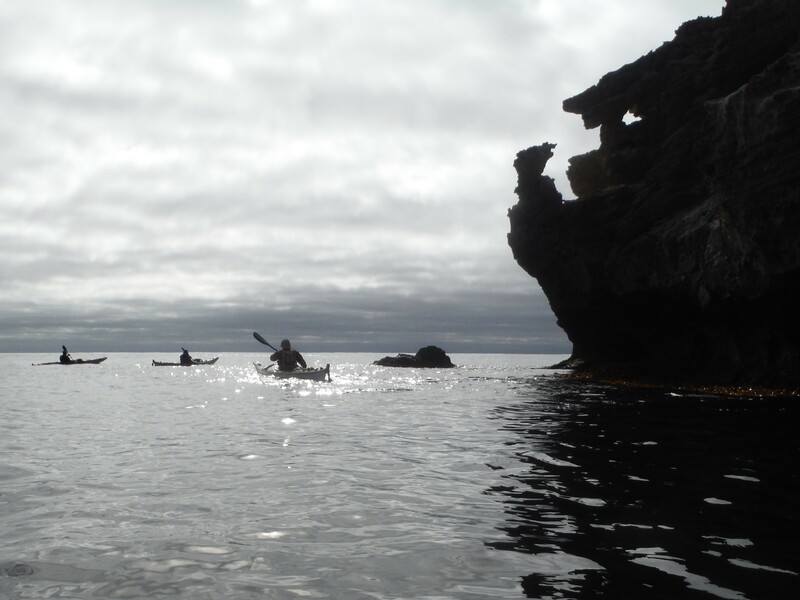 The sea took on an eerie feel as it was difficult to distinguish the sea from the sky and the inky swells rising and falling under the kayak added to the strange sensation. 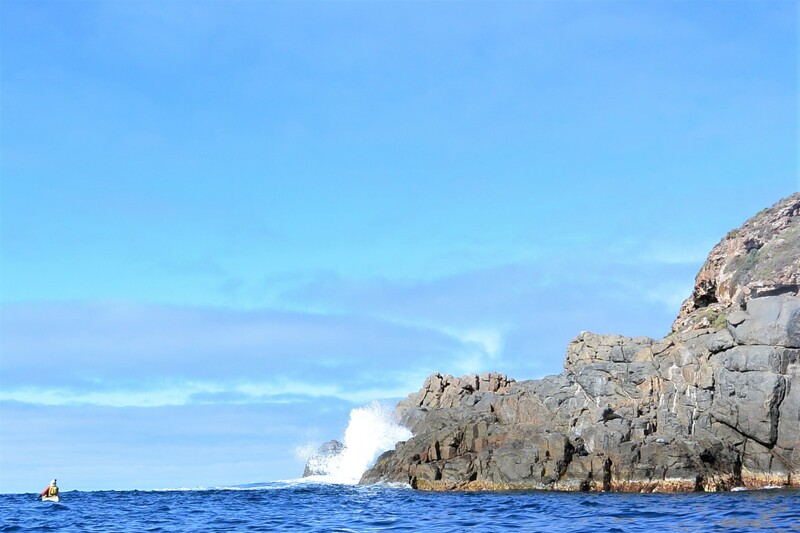 We got up close and personal with a cliffs that towered 90 metres above us all the time mindful that those boulders hanging precariously above fell into the sea at regular intervals. 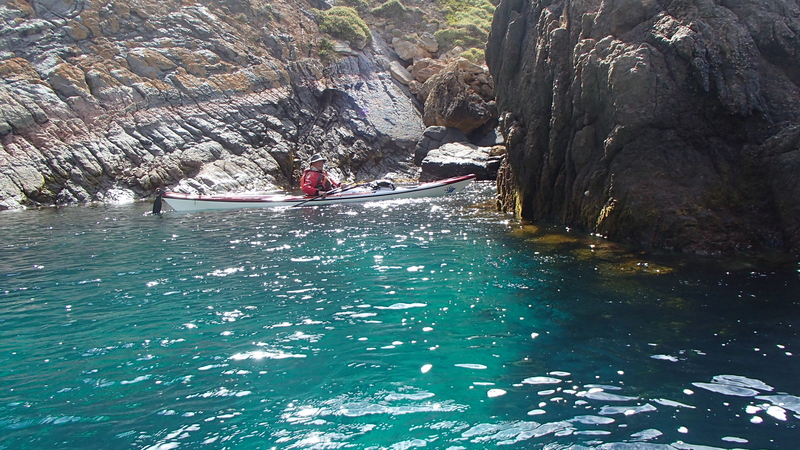 The swells lifted us gently and then crashed against the base of the cliffs sending backwash to bounce us around. 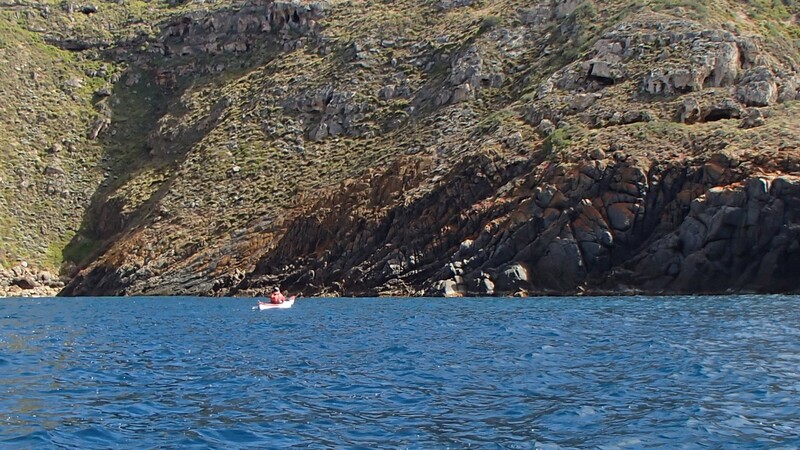 We were able to sneak into small ravines that were sheltered from the wind and swell to enjoy the crystal clear waters and views of the towering granite cliffs. 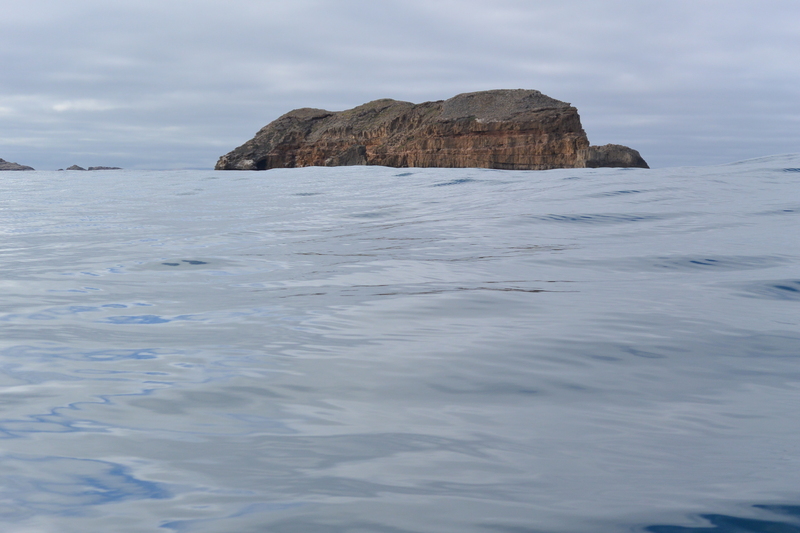 The area also has some small offshore islands to explore and we paddled close into the cliffs in the lee of the islands and bounced our way past the unprotected sides. 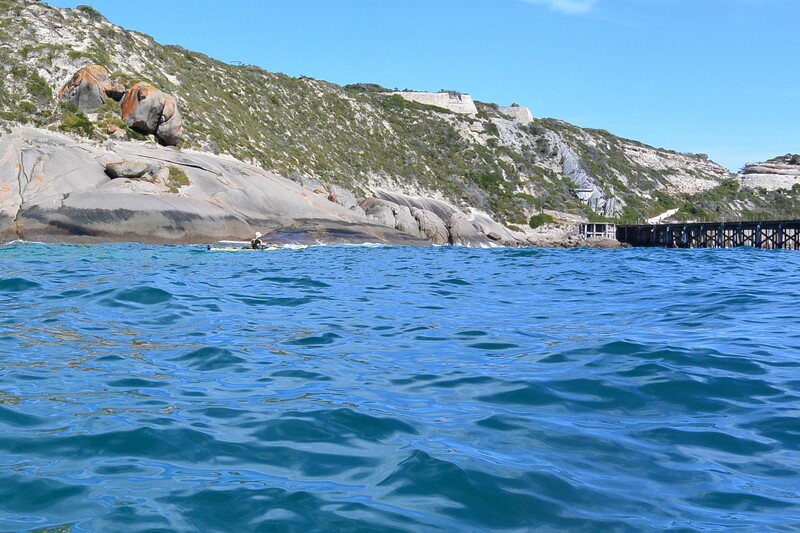 A 10 km paddle out to a sea lion colony increases the senses, especially when you realise that Great White Sharks breed in the nearby reefy waters. 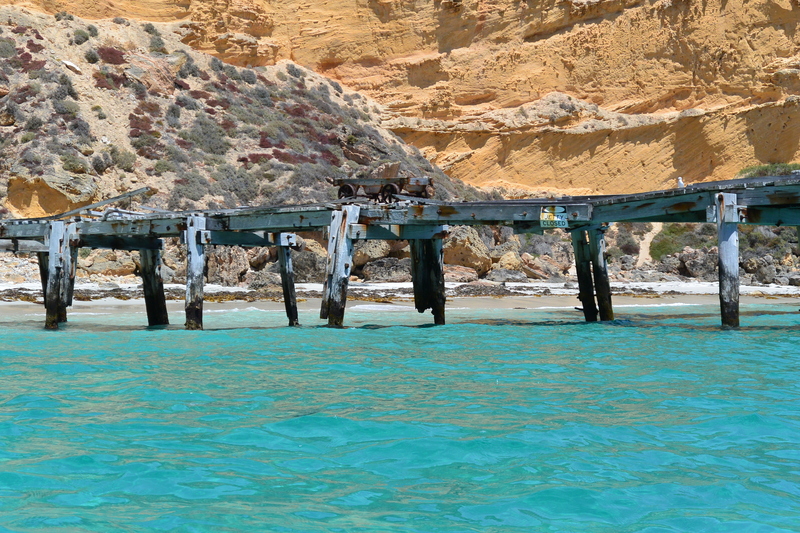 This coast was home to many industries in earlier times and many jetties were built to accommodate the fleet of vessels that carted grain, seafood and gypsum. 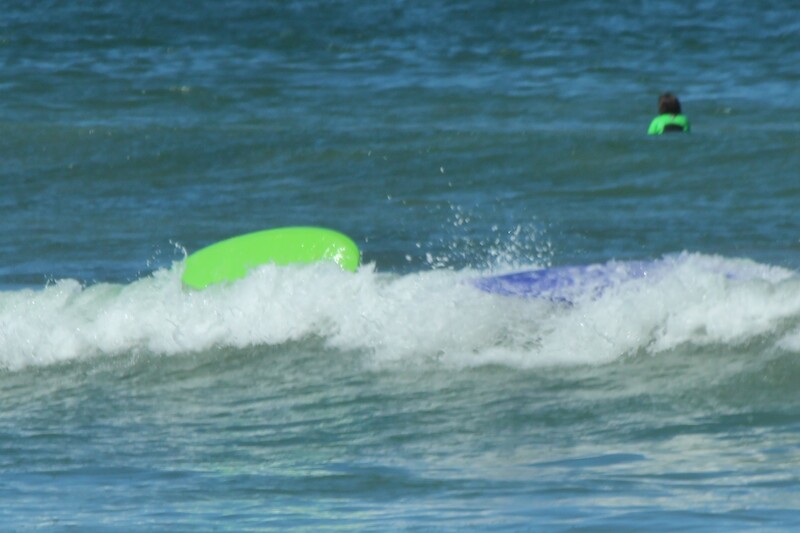 …..and others are about to fall into the sea. 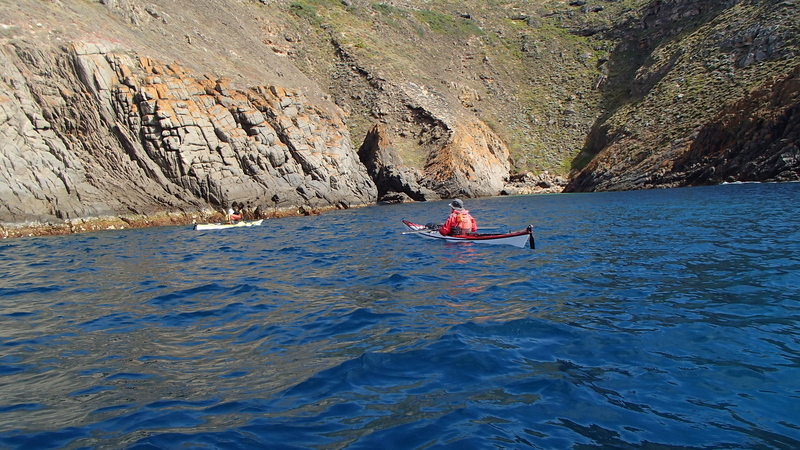 After exploring a number of inlets and caves we were able to land on a small protected beach where Steve serenaded a couple of the locals. If anyone can “talk to the animals” Steve can. 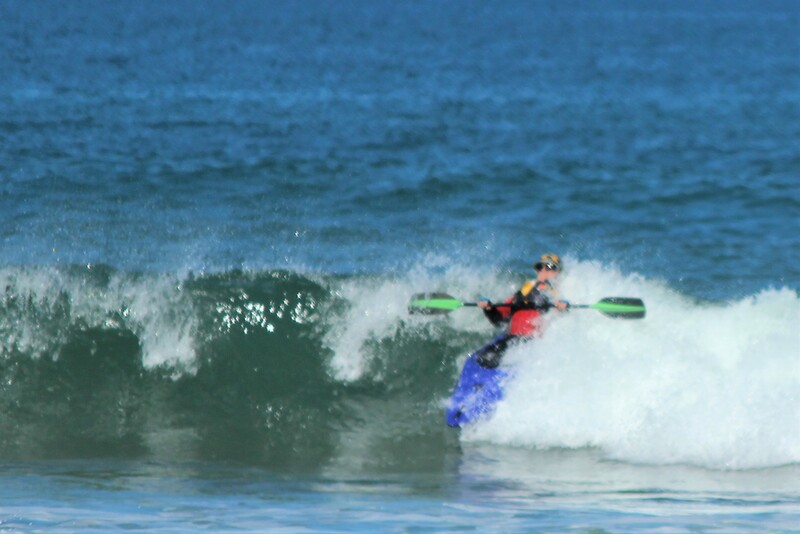 After a quick lunch on the beach it was an interesting paddle into a confused sea created by the increasing SW swell colliding with the ESE wind driven sea. 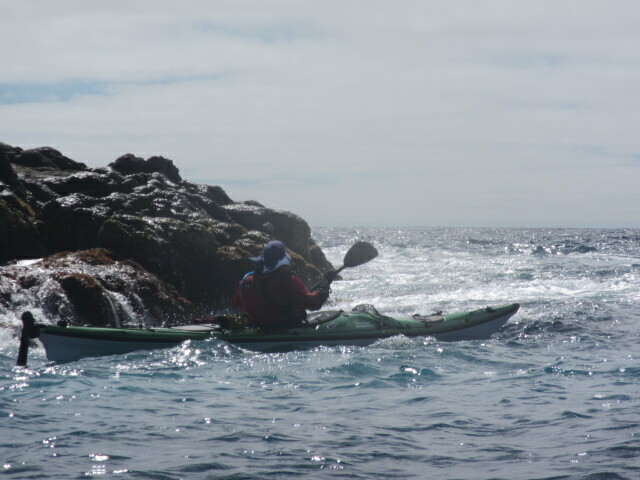 “Wind against Current” always makes for some interesting paddling and quite often reacquaints you with your support stroke. 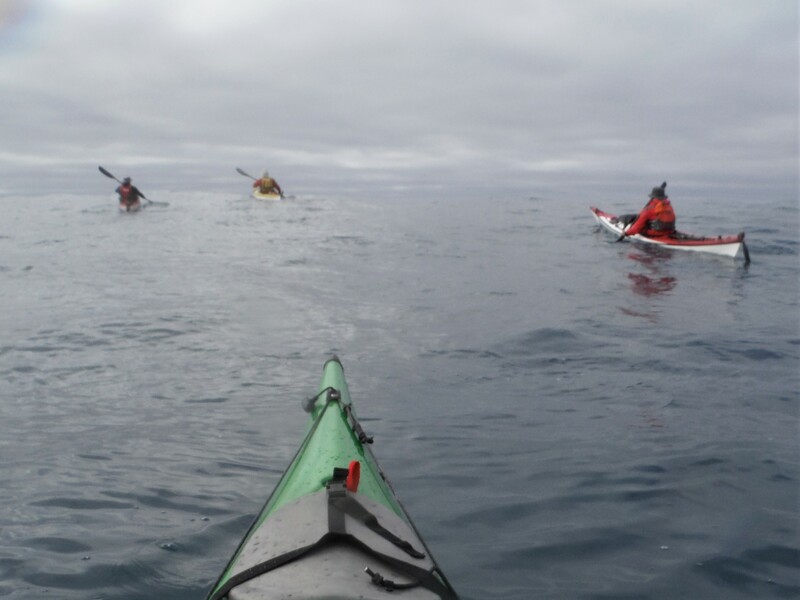 The conditions dictated that we stayed close together for the last 2 hours of paddling and we all witnessed a large pod of dolphins fishing under our kayaks. They screamed past, some leaping a metre or more into the air as they zig zagged through a school of fish below us. 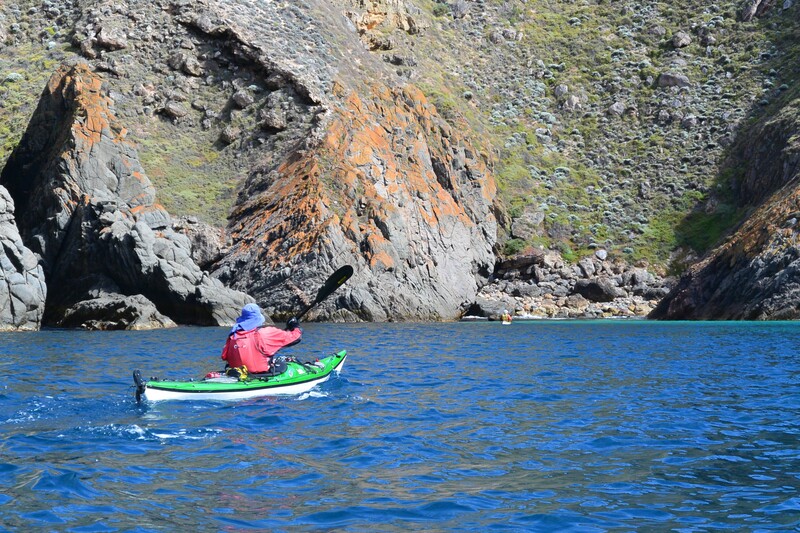 The fish were forced to the surface by the dolphins and then a flock of seabirds dive bombed from above. 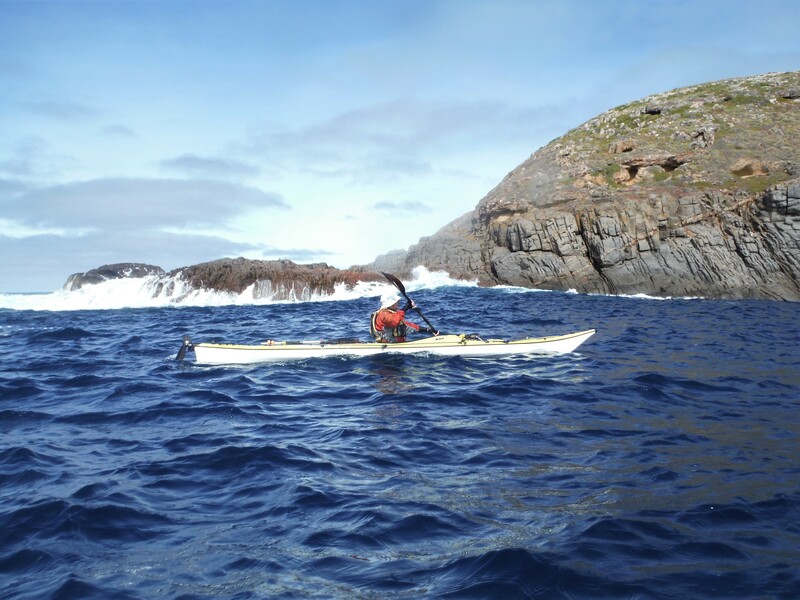 Fascinating stuff, but no one got any photos as at the time it was “both hands on paddle”. 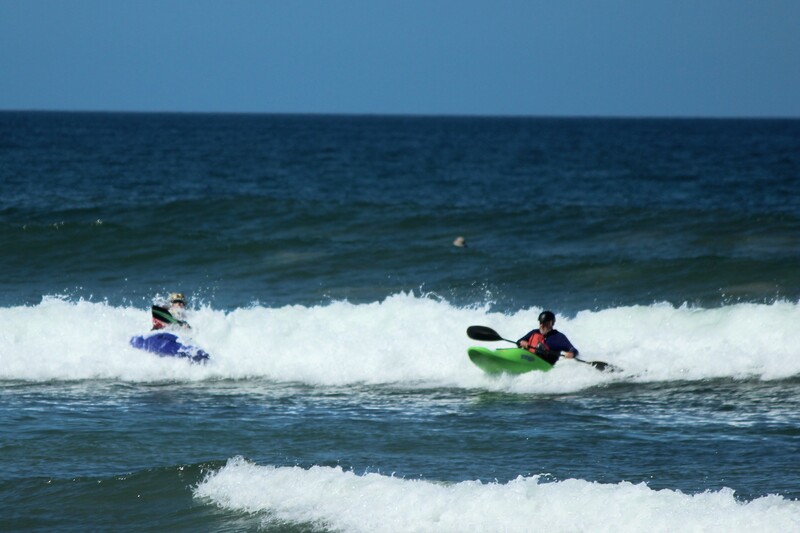 This was probably not the best time and place to demonstrate your rolling technique: in the middle of a feeding frenzy of dolphins and sea birds along a coast well known for its Great White Shark population. 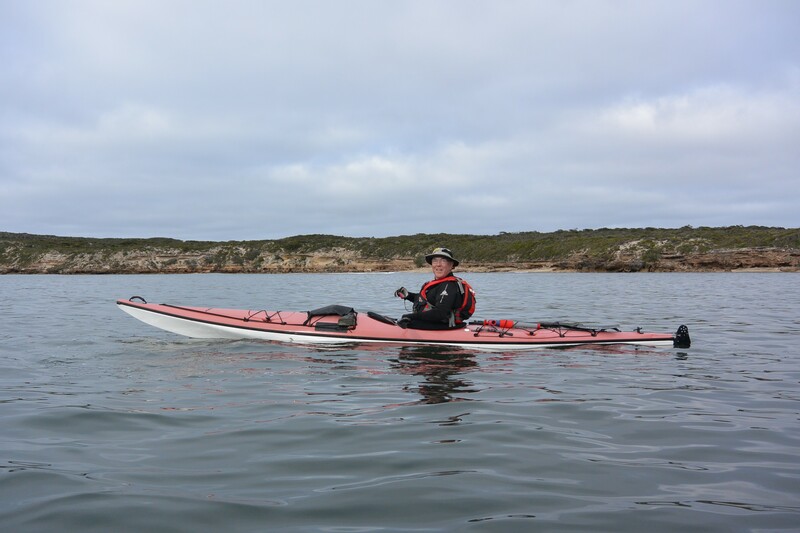 After many exhilarating hours of paddling, beach combing and wildlife spotting we made our destination and after much lugging of gear and carrying of kayaks we returned to our campsite. As is our custom, we celebrated firstly with an icy cold beer and snacks provided by Robyn and later moved on more substantial eats and sampled the red wines from several wine regions in South Australia. Tastings covered the Coonawarra and McLaren Vale regions as well as excellent Shiraz from Koltz Wines of Blewett Springs (McLaren Vale region). Let me pre-answer some of the questions we normally get from readers and people who meet us on the beach. Yes we are all well on the wrong side of 60. Make that 70 for Rodney. Yes we are all retired from normal work. Yes we do this for fun. Yes my camera is waterproof. I hope ! 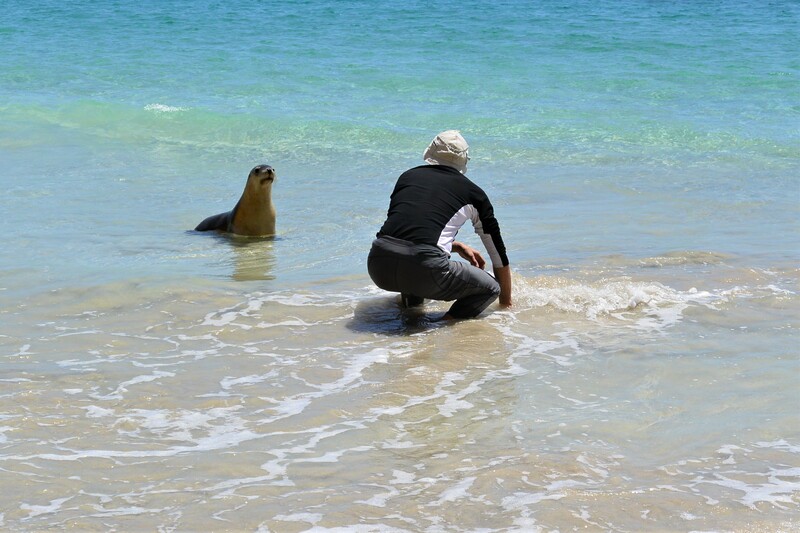 No we don’t have time to drop in a fishing line while paddling. 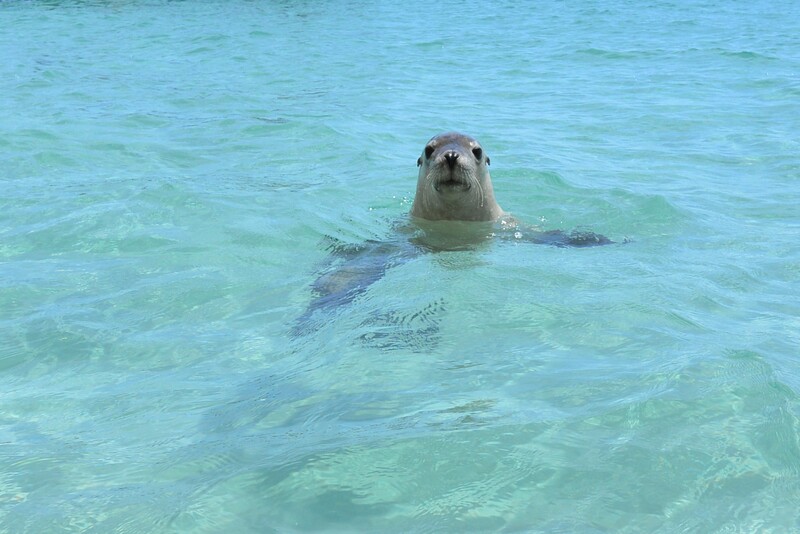 No we are not afraid of sharks, stingrays or jellyfish. Well maybe just a little bit. No we aren’t sponsored by a winery, but would like to be. 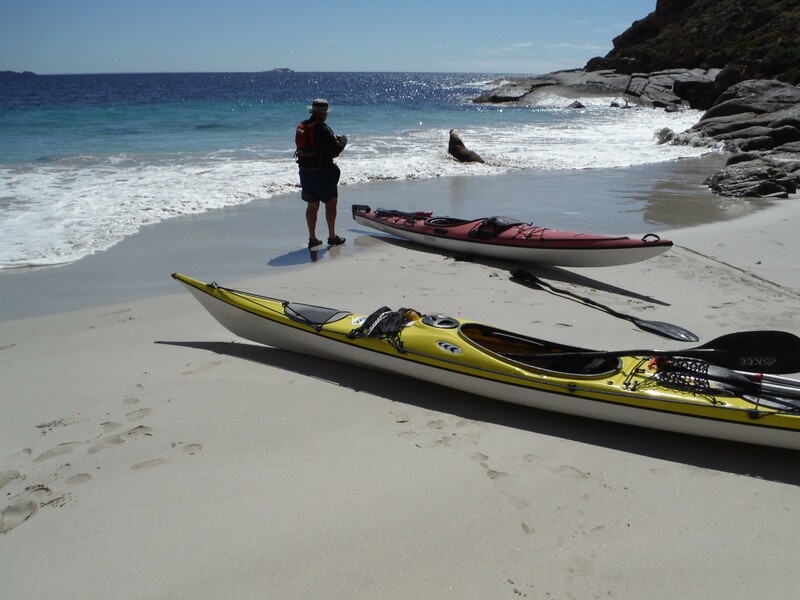 Thanks to our paddlers Gavin, Steve, Rodney and Ian who donated their photos to this story and to Robyn for the cold beer, vehicle driving and many other duties.